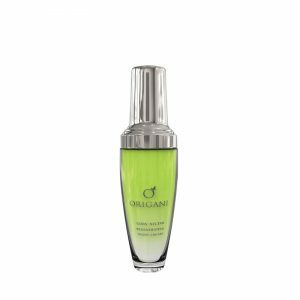 Gods’ Nectar Daily Glow Toning Cleanser – Daily Glow Toning Cleanser offers the most tender, gentle cleansing of skin which tends to feel and look tight and dry. This softly soothing formulation removes all traces of dirt, oil and impurities while boosting hydration levels for a more radiant appearance and a beautifully balanced feeling of comfort. 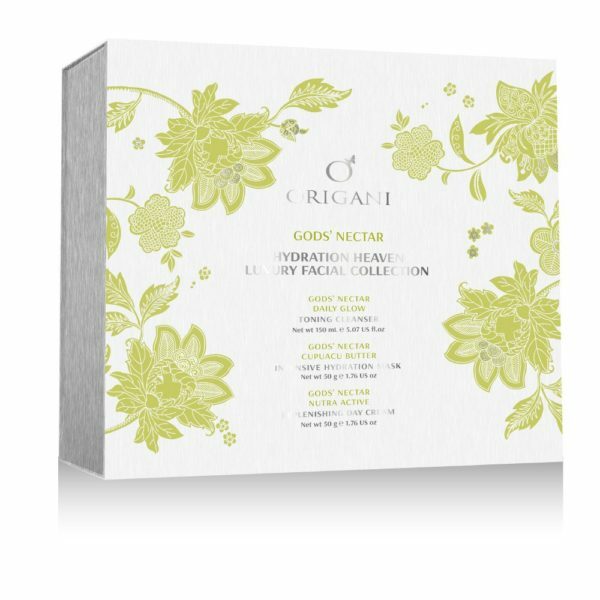 Gods’ Nectar Cupuacu Butter Intensive Hydration Mask – Delivers the lushest, most concentrated moisture surge to dry, dehydrated skin. Cupuacu butter, derived from Brazilian rainforests, cocoons your skin to give it a fresh, plump appearance, improved elasticity and high moisture levels. It is prized for its rich content of phytosterols to benefit parched, damaged skin. This luscious mask also offers maximum comfort and hydration via the addition of Manuka honey, Aloe vera, shea butter and grape seed oil. Gods’ Nectar Nutra Active Replenishing Day Cream – Defend your vulnerable, parched skin against the dehydrating and ageing effects of our environment. Your skin will experience a lavish boost hydration levels, a plumper, more radiant appearance and a beautifully soothing level of comfort. Gods’ Nectar Nutra Active Replenishing Day Cream creates a resilient moisture veil resembling a ‘second skin’ which alleviates the discomfort of dry skin symptoms. Nutra Active Day Cream contains a natural biolipid complex called Amisol Trio™ which provides ‘super-fatting’ properties, protection and perfect moisture balance by actually adhering to the surface of your skin leaving a pleasant, soft silky feeling. Gently massage two to three pumps into slightly dampened skin of face, neck and décolletage. Rinse thoroughly with warm water and follow with either Origani Day Cream or Origani Night Cream. Use morning and night. Smooth a fine layer onto damp skin of face, avoiding eye area. Rest for approximately ten minutes then rinse thoroughly with warm water. Follow with God’s Nectar Day Cream or Night Cream. Apply once weekly or when skin is feeling uncomfortably dry or stressed. Store between 5°C /41°F and 30°C / 86°F. Avoid direct sunlight. For external use only. Avoid eye area. WARNING: KEEP OUT OF REACH OF CHILDREN. AVOID EYE CONTACT. If irritation occurs rinse off immediately, using copious amounts of fresh running water and pat dry; wait fifteen minutes and then apply plain moisturiser. Discontinue use. Cleanse skin first with Gods’ Nectar Toning Cleanser. Apply Day Cream to face, neck and décolletage with a gentle upward motion. Daily application essential. – Gods’ Nectar Daily Glow Toning Cleanser – Daily Glow Toning Cleanser offers the most tender, gentle cleansing of skin which tends to feel and look tight and dry. This softly soothing formulation removes all traces of dirt, oil and impurities while boosting hydration levels for a more radiant appearance and a beautifully balanced feeling of comfort. 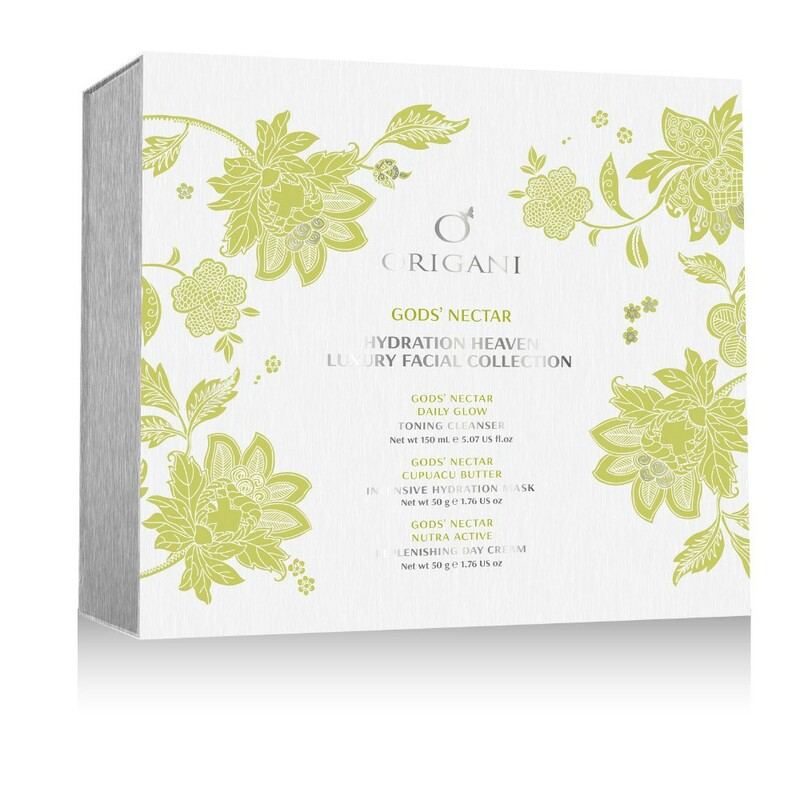 – Gods’ Nectar Cupuacu Butter Intensive Hydration Mask – Delivers the lushest, most concentrated moisture surge to dry, dehydrated skin. Cupuacu butter, derived from Brazilian rainforests, cocoons your skin to give it a fresh, plump appearance, improved elasticity and high moisture levels. It is prized for its rich content of phytosterols to benefit parched, damaged skin. This luscious mask also offers maximum comfort and hydration via the addition of Manuka honey, Aloe vera, shea butter and grape seed oil. – Gods’ Nectar Nutra Active Replenishing Day Cream – Defend your vulnerable, parched skin against the dehydrating and ageing effects of our environment. Your skin will experience a lavish boost hydration levels, a plumper, more radiant appearance and a beautifully soothing level of comfort. The complete collection gives everything you need. The hydration mask is my personal favorite due to the organic butters and oils it uses. My skin is super dry and sensitive so it’s fantastic to have such a boost of moisture for my parched skin. Highly recommended to all with sensitive dry skin.